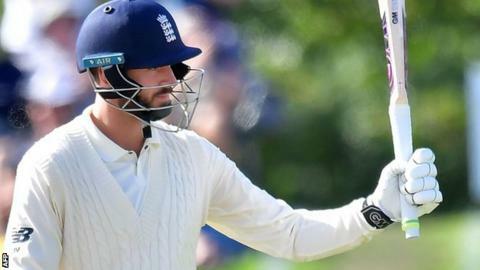 James Vince hopes a move to opening for Hampshire will enhance his case for a return to England's Test side. Vince has held conversations with England selector Ed Smith and captain Joe Root to find out how he can reclaim a place in the team this summer, with an Ashes series starting on 1 August. "The feedback I have got is the higher up the order you bat, the better," the 28-year-old told BBC Radio Solent. "They're more willing to move people down the order rather than up." Vince played the last of his 13 Tests in March 2018 against New Zealand, but was overlooked for series against Pakistan and India last summer and the winter tours to Sri Lanka and West Indies. The Hampshire captain averages 24.90 in 22 Test innings with three half-centuries. Despite a hundred in the first Test against Sri Lanka, Keaton Jennings' struggles for the remainder of the winter have made him vulnerable for the visit of Australia. Fellow opener Rory Burns also failed to find any consistency on tour. "I guess with how the winter has gone, it probably looks from afar that at the top of the order is where spaces may open up," Vince told BBC Radio Solent's Hampshire fans forum. "I don't think just opening the batting is going to make a difference, but opening and doing it well will. "Opening for Hampshire isn't a decision based purely on my future and trying to get back in the England side. Jimmy Adams retired last season and we've lost an experienced opener. "Going from number three to opening isn't a massive jump. It will be more of a mental thing and I think we've got a lot of people at Hampshire who are comfortable in the middle order." Hampshire first-team manager Adrian Birrell is backing Vince's move. "He needs to give himself the best chance of playing for England," he said. "My job here is to compete for trophies and produce England players. "We want to give our players the best possible chance to play for England, so if he puts the numbers on the board, he's got every chance." Hampshire visit Oxford MCCU for a three-day match starting on Sunday, before getting their County Championship campaign under way against Essex on 5 April.